The only major American Civil War combat to occur in Ohio was the Battle of Buffington Island. Confederate cavalry leader Brigadier-General John Hunt Morgan led a force to northern Kentucky to create disorder within the Union military. 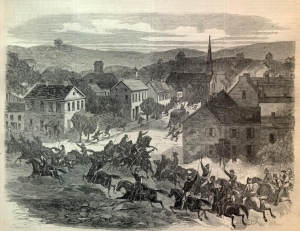 Morgan succeeded in causing unrest for the enemy and exceeded his orders by crossing north of the Ohio River. On July 8, 1863, Morgan and approximately two-thousand soldiers crossed over the river into southern Indiana.